RED ARROW (AUS) (Bay 2003-Stud 2010). 4 wins from 1100m to 1300m, Hollywood Los Angeles H., Gr.3. Sire of 88 rnrs, 43 wnrs, inc. Arrow Lane, Berri Cherry - China Paradise (Mac. ), Red Banner - Celestial Arrow (H.K. ), Made in China, Tornado of Souls, Bow Noculars, Cool Target, Princess Arrow, Final Arrow, Century Arrow, Brave Bow, Brax, Just Mak, Lucky Boy, Cupid's Roze, Divine Design, Extra Cover, Lucky Six, Miss Communication, Raise a Red, etc. PRINCE MAMBO (Thewayyouare). Second Top Colt on The 2013-14 NZ 2YO Free H. 5 wins-2 at 2-from 1000m to 1600m, NZ$220,740, to 2016-17, Matamata RC Slipper S., L, Hawke's Bay Breeders Association Mile, Taranaki RC Cast Iron Services H., Waikato RC Baker Racing Stables H., Greene Racing Juvenile H., 2d Manawatu Sires' Produce S., Gr.1, Hawke's Bay Guineas, Gr.2, 3d New Zealand Two Thousand Guineas, Gr.1, 4th WRC Levin Classic, Gr.1, Rangitikei Gold Cup, L.
Tequila Sunrise. 4 wins from 1600m to 2100m, Marton JC Rural Fuel H., Taranaki RC Metro Inspiration Glass H., 2d Wanganui JC Carpet Maintenance H., 3d Waikato RC Fairview Motors H.
Lady Guinness. 3 wins from 1300m to 1600m to 2017-18, Hawkes Bay Trinity Hill Mile. Galaxy Star (g. by Falkirk). 5 wins at 1200m, 1400m, NZ$107,565, Matamata RC Marks Ewen & Associates H., Manawatu RC Colliers International H., Marton JC Lee European Premier H., 2d ARC VRC Trophy H., CJC Barneswood Farm H., WRC JR & N Berkett Telegraph H., 3d WRC Lightning H., L, Matamata RC Waikato Stud H.
Spinnrad (g. by Kaapstad). 3 wins at 1400m, 2000m, 3d AJC Beau Zam H., STC P&N Beverages H.
Life of Reilly (g. by Montjeu). Winner at 2m, 2d Killarney Brandon H. Hurdle. Ramesses (g. by Hussonet). 3 wins to 1200m in Aust. Candy Stargazer (f. by Postponed). Winner at 1200m in NZ. Lincoln Memorial (g. by All American). Placed in Aust. BEAUTY'S BEAST (Guillotine). 7 wins to 1500m, NZ$43,325, A$219,235, ATC South Pacific Classic, L, ARC The Edge H., ATC Perfection Fresh H., HQ of Insurance H., BOP RC Triton Pacific Owen P., Te Aroha JC Towes Insurance Brokers H., 2d ARC The New Zealand Herald H., ATC TAB Rewards H.
Yanson (Guillotine). 8 wins-1 at 2-to 1200m to 2016-17 in Macau, 2d Macau Chairman's Challenge Cup, L, 3d Macau Berlin H., Makati H.
Beauty's Rose. 2 wins at 1300m, 1400m in 2016-17, Taranaki RC Harold Tuson Life Member H., 2d Rotorua RC Rydges Hotel Rotorua H.
Dustbunny (f. by Kaapstad). Placed in Aust. FARSON (Snitzel). 4 wins from 1200m to 1800m, A$219,005, in 2016-17, MRC Autumn Classic, Gr.2, Moorookyle Park Thoroughbred Stud H., MVRC Simpson Construction H., 3d MVRC Alister Clark S., Gr.2. Cool Clear Water. 4 wins-3 at 2-to 1200m, WATC War Cry H., Possum H., Dale Graduation S., 2d WATC Clark H., Artesian Graduation S. Producer. ZOLA (Volksraad). 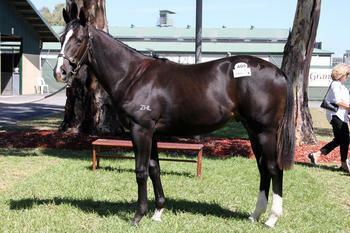 Third top filly on The 1997-98 Australasion 2YO Classification. 5 wins-4 at 2-from 1000m to 1600m, NZ$152,625, A$79,800, ARC Ellerslie Sires' Produce S., Gr.1, Waikato RC Star Way S., L, VATC Marvel Loch H., WRC NZ Magic Millions 2YO Fillies S., Horse & Hound 2YO S., 2d STC Tea Rose S., Gr.2, Phar Lap S., Gr.2, 3d AJC Light Fingers S., Gr.2, 4th VRC Matron S., L. Producer.